You know what they say as a man grows up – he might not be playing with little green army men made out of plastic any more, but would have moved on to big boys’ toys. 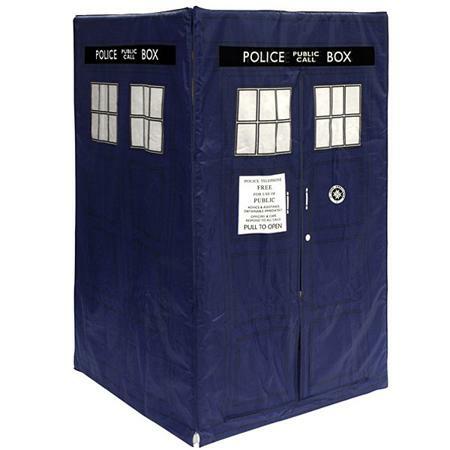 Some of these could be rather expensive, while others are affordable, such as the $89.99 Doctor Who Tardis Play Tent. You can be sure that the little ones in your home too, would not be able to resist playing with this, but you can kindly ask them to move out so that you can check out the 11th Doctor’s control room all by yourself. Not only that, since it is made out of sturdy canvas construction and stand at nearly 6 feet in height, there is plenty of space in there to hook up with other Doctor Who fans should you erect this at your backyard the next time you host a party in your home. If you do not want to place the Doctor Who Play Tent outside of your four walls, place it right in your living room, it would not mind such a position, either. Entering it, you are able to use your imagination as to what goes on within the four canvas walls. Once done, just fold it back and it can be easily stashed away in the storeroom without taking up too much space. Of course, you might want to have some heart for the little ones and let them play in it from time to time, right?